Chart No. 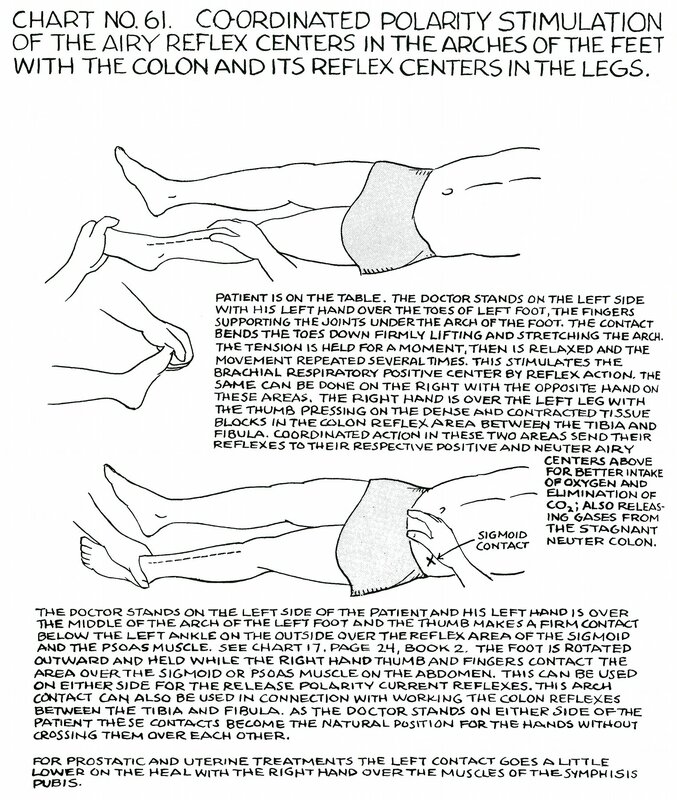 61 - Co-ordinated [Coordinated] Polarity Stimulation of the Airy Reflex Centers in the Arches of the Feet with the Colon and Its Reflex Centers in the Legs. Patient is on the table. The doctor stands on the left side with his left hand over the toes of left foot, the fingers supporting the joints under the arch of the foot. The contact bends the toes down firmly lifting and stretching the arch. The tension is held for a moment, then is relaxed and the movement repeated several times. This stimulates the brachial respiratory positive center by reflex action. The same can be done on the right with the opposite hand on these areas. The right hand is over the left leg with the thumb pressing on the dense and contracted tissue blocks in the colon reflex area between the tibia and fibula. Coordinated action in these two areas send their reflexes to their respective positive and neuter [neutral] airy centers above for better intake of oxygen and elimination of CO2 [carbon dioxide]; also releasing gases from the stagnant neuter [neutral] colon. The doctor stands on the left side of the patient and his left hand is over the middle of the arch of the left foot and the thumb makes a firm contact below the left ankle on the outside over the reflex area of the sigmoid and the psoas muscle. See Chart 17, page 24, Book 2. 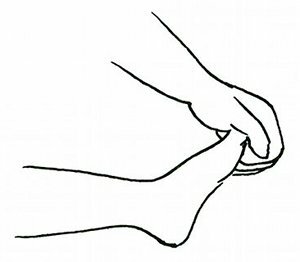 The foot is rotated outward and held while the right hand thumb and fingers contact the area over the sigmoid or psoas muscle on the abdomen. This can be used on either side for the release polarity current reflexes. This arch contact can also be used in connection with working the colon reflexes between the tibia and fibula. As the doctor stands on either side of the patient these contacts become the natural position for the hands without crossing them over each other. For prostatic and uterine treatments the left contact goes a little lower on the heal [heel] with the right hand over the muscles of the symphisis pubis [pubic symphysis].